Unlike the larger differentiated terrestrial planets that have metallic Fe-Ni cores, and silicate mantles and crusts, most meteoritic matter is from small, undifferentiated parent bodies. These meteorites have approximately Solar abundances of Fe and Ni, where Fe is partly present as metal, and partly oxidized residing in silicates. The term "undifferentiated" also refers to the side-by-side occurrence of phases formed at low and at high temperatures. Low-temperature phases are concentrated in the fine-grained matrix that is composed of |xm-sized minerals and typically rich in volatile elements and compounds. High-temperature phases are rare, cm-sized calcium-aluminum-rich inclusions (CAIs) and abundant sub-mm to mm-sized droplets, crystallized from liquid silicates. 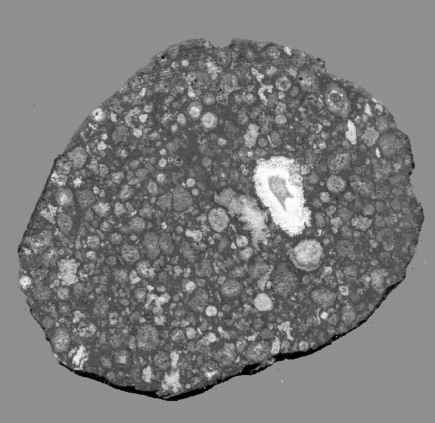 From these so-called chondrules undifferentiated meteorites received the name chondrites (Fig. 5.1). These high-temperature components predate accumulation of planetesimals and record high temperature events in the early Solar Nebula. The two major classes of undifferentiated meteorites are ordinary chondrites - the most abundant class of meteorites delivered to Earth - and carbonaceous chondrites. Carbonaceous chon-drites can have significant amounts of water and carbon and contain more matrix (30-100%; Table 5.1) and fewer chondrules than ordinary chondrites. Matrix often contains hydrous minerals resulting from ancient interaction of liquid water and primary minerals. 1 Minerals in meteorites are frequently considered in terms of a condensation sequence: refractory minerals containing Ca and Al comprise oxides (corundum Al2O3, hibonite Ca(Al,Ti,Mg)12O19, spinel MgA^Ozt) and silicates (melilite - solid solution of akermanite Ca2MgSi2O7 and gehlenite Ca2Al2SiO7). They condense at higher temperatures than metal or the Mg-silicates forsterite (Mg2SiOzt) and enstatite (Mg2Si2O6) - the Mg-rich endmembers of solid solutions olivine and pyroxene. At lower temperatures, Ca and Al minerals can be transformed into diopside (CaMgSi2O6, a Ca-rich pyroxene) and anorthite (CaAl2Si2Os, the Ca-rich endmember of feldspar solid solution), and Fe can enter Mg-silicates. Volatile elements condense in the most recent compounds/minerals. Aqueous alteration processes occur mainly on carbonaceous chondrite parent bodies and produce hydrous minerals - e.g. smectite, serpentine (Mg,Fe)3Si2O5(OH)4 - or carbonates, e.g. calcite CaCO3. Mineral formation processes can be dated if they fractionate parent and daughter elements of radiometric systems. Important for radiometric dating are minerals in which parent nuclides are concentrated, e.g. phosphates for U-Pb-Pb and 244Pu fission-track dating, and feldspar for K-Ar and 26Al-26Mg dating. Fig. 5.1. The undifferentiated carbonaceous chondrite Allende. This rock was probably never heated to temperatures above 500 ° C. It preserves a variety of primitive, pre-accretionary components, such as chondrules, and Ca-Al-rich inclusions, the oldest known material in our Solar System. Meteorite collection, Dieter Heinlein, Augsburg, Germany. condensates, others think they are residues of early heating processes. In any case they are the oldest dated objects in our Solar System with an age of 4567.2 ± 0.6 million yr (Amelin et al., 2002), as obtained by radiometric dating using the U-Pb-Pb method based on the decay of long-lived parent nuclides 238U and 235U into 206Pb and 207Pb (Chen and Wasserburg, 1981; Allegre et al., 1995). The formation of chondrules (Fig. 5.1) requires temperatures of 1600 K or more depending on the extent of melting. Most chondrules appear to be 1 to 4 million yr younger than CAIs (Russell et al., 1996; Kita et al., 2000; Amelin et al., 2002), although some chondrules approach the ages of CAIs (Bizzarro et al., 2004). It is not clear how CAIs or chondrules fit with observations or models of coagulation of dust particles (see also the reviews by Wurm and Blum in Chapter 6 and Henning et al. in Chapter 7). 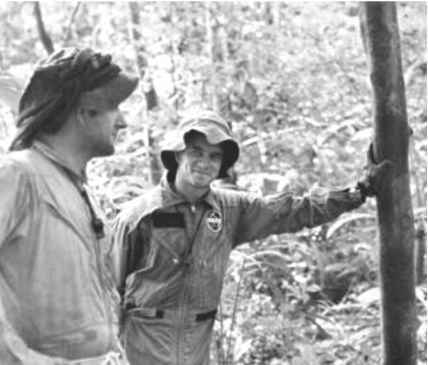 Some researchers believe that CAIs formed close to the protoSun and were then transported by X-winds to larger radial distances, where they were incorporated into locally formed rocks (Shu et al., 1996). A large number of models for chondrule formation is discussed in the literature (Scott et al., 1996), ranging from lightning, collisions between first generation planetesimals (e.g. Lugmair and Shukolyukov, 2001; Sears, 2004), or shock waves in the Solar Nebula (Desch and Connolly, 2002). Chondrules cooled faster than CAIs (100-2000 Kh-1 versus 10 Kh-1), reflecting different thermal regimes. The ubiquitous presence of chondrules in all chondritic meteorites, except Cl-chondrites (see Section 5.4), suggests that the chondrule-forming process was an important and widespread process in the early Solar System. However, it is uncertain if all matter in planets and asteroids has passed through the chondrule-forming process. Recent studies suggest a chemical complementarity in some chondrites between chondrules and matrix implying that chondrules and matrix formed from the same reservoir, essentially Solar composition for non-volatile elements. This excludes models where chondrules formed in a different part of the Nebula and combined accidentally with some fine-grained material (Klerner and Palme, 2000; Klerner, 2001).